The return of NFL football kicks into full gear this week and Thursday’s action kicks off with a battle between the Atlanta Falcons and the Miami Dolphins. Preseason games are a time for teams to find out exactly who will be playing for them, whether it be specialists, rotational guys, or full time starters. Below, PFF’s team of analysts have all the most important position battles and players to watch during today’s game. Former Falcon Chris Chester retired early this offseason, leaving an opening along the Falcons offensive line at the right guard position. Atlanta’s first unofficial depth chart lists Garland as the starter in front of Schweitzer, while Harlow is listed as the back-up left guard behind Andy Levitre. Ben Garland is a converted defensive tackle who logged 42 snaps on offense and 42 snaps on defense last season. Schweitzer sat out last season, but ranked 25th in the NCAA in 2015 in pass blocking efficiency while actually lining up at tackle for San Jose St. Despite being listed at left guard, Sean Harlow will still compete for the right guard position. The rookie Harlow played mostly tackle last season with Oregon St. while registering a Run Block Success Percentage of 96.8 percent, which was the highest percentage of all tackles in the 2017 draft class. Thursday night will likely be our first look at 2017 first round pick Takkarist McKinley, an edge defender out of UCLA. McKinley was expected to miss the start of training camp earlier on this off-season while recovering from shoulder surgery, but ended up being active on the practice field on day one of Falcons’ camp. The Falcons will likely use McKinley in a pass rushing role opposite 2016 sack leader Vic Beasley especially after McKinley ranked 15th in pass rush productivity (14.4) among edge defenders in the 2017 draft class. As noted in PFF’s 2017 Training Camp Battle Watch, the second starting corner position was slated to be a race between Robert Alford and Jalen Collins. Unfortunately, Collins was handed a ten game suspension for a PED violation, which opens the door for former UDFA C.J. Goodwin to compete for more playing time. 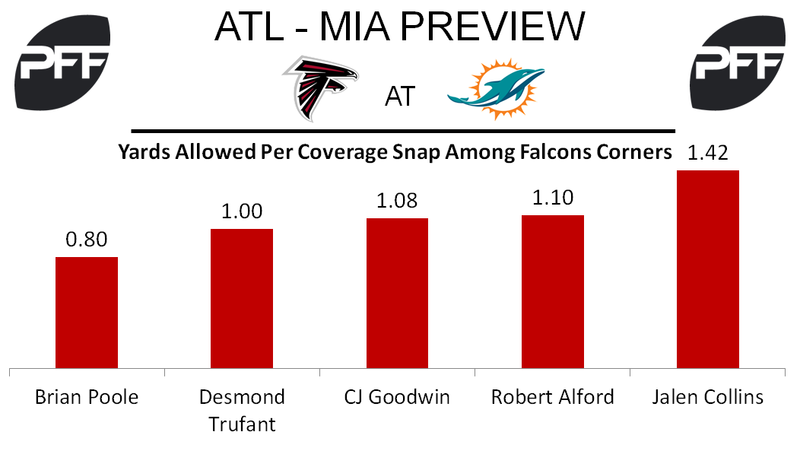 Goodwin played on just 18.1 percent of defensive snaps last season, but played well in the Super Bowl, registering three tackles while being target five times surrendering three of the targets for catches and twenty-five yards. Goodwin also had one pass break up in the game and will look to build on that game going forward. The Falcons spent their third-round pick on former LSU Tigers’ linebacker Duke Riley. Riley is listed as the back up behind starter De’Vondre Campbell and would figure to see plenty of playing time once the starters come out. Despite not becoming a starter until last season, Riley played on 89.7 percent of snaps for LSU in 2016 and was effective in pass coverage ranking second in the SEC in yards per coverage snap allowed at 0.42 yards. Jay Ajayi has the number one running back spot locked up, but the backup position is up for grabs in Miami. 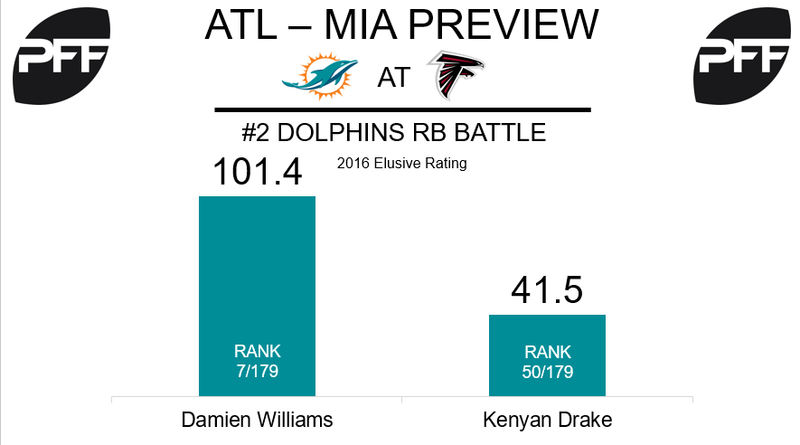 Damien Williams and Kenyan Drake will be competing for that second spot, and how they perform in preseason will go a long way towards deciding who will earn more playing time come the regular season. In 2016, Williams and Drake had similar snap counts, Williams checking in at 176, and Drake at 117. Williams had an extremely high elusive rating last year at 101.4, which was seventh among all 179 running backs in the NFL. Drake checked in at 50th overall with an elusive rating of 41.5. Jay Cutler and Matt Moore will be the top two quarterbacks on the depth chart for Miami entering the regular season, but that means 2016 seventh-round pick Brandon Doughty should see plenty of action in the preseason. In 2015, his final collegiate season at Western Kentucky, Doughty was first in the nation among 70 qualified quarterbacks in passer rating at 122.4, and in adjusted completion percentage at 81.8. Carroo was drafted in the third round of the 2016 NFL Draft, but he did not play much in his rookie season, as he played only 120 snaps. In his final collegiate season in 2015, Carroo was second out of 332 qualified receivers in yards per route run at 4.65, and he was also second out of 235 receivers in deep pass catch rate at 68.4. Lippett comes into the season having played the most snaps out of any current Dolphins cornerback in 2016 at 917, but he struggled, as his overall grade of 48.9 was 80th out of 110 qualified corners. Lippett will have to earn his playing time in the preseason, as Byron Maxwell and Xavien Howard are the two starting corners right now according to the team’s first released depth chart.